"BREAKING: Ricky Burns to fight Liam Walsh on December 15th!" 1) Liam Walsh hasn't beat a Top Ten Ranked fighter. 2) Liam Walsh was a Super Featherweight two fights ago. 3) The momentum from Burns stopping Kevin Mitchell drops slightly. "When will Ricky Burns fight a 'World Class' fighter?" This couldn't be any further from the truth. 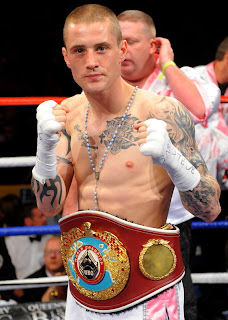 At Lightweight, Ricky Burns has fought and beat Michael Katsidis, Paulus Moses and Kevin Mitchell. All three were in the top ten rankings, all three have fought for, or won a version of the world title at some point in their career's, and all three are world class fighters. Just because Ricky Burns made it look easy against them, doesn't mean they aren't world class, it just means Ricky Burns is an elite Lightweight. And let's not forget, Ricky Burns beat the lineal Super Featherweight champion, Roman Martinez, when he won the WBO Super Featherweight Title in 2010. Since then Martinez has gone on to win another world title. If Ricky Burns ends up fighting Adrien Broner in a huge fight early next year, all will be forgiven and forgotten. Burns isn't in a mouth-watering fight now, but he has had a tough run of fights, and there are more big fights to come, so a little bit of patience is needed for now. It's also never a bad thing for champions to stay active. Orlando Salido, the WBO Featherweight champion, does this often. If anyone should get the blame, it should be the match-maker, not Ricky Burns.